Goldman Sachs upgraded Expedia to buy from neutral, also raising its 12-month price target on the stock to $140 from $125. The stock's "relatively low trading multiple means it is likely to outperform in a tougher market environment for growth stocks," analyst Heath Terry wrote in a note to clients. Expedia is currently trading in a bear market, with shares down 22% from their 52-week high. Goldman Sachs upgraded Expedia to buy from neutral on Friday, saying the travel company's relatively cheap valuation and growth potential make it a compelling stock to own for 2019. "While we're still generally cautious on the travel space given tight supply and healthy underlying demand, we believe TripAdvisor and Booking's recent ad spend rationalization puts Expedia in a better relative position. 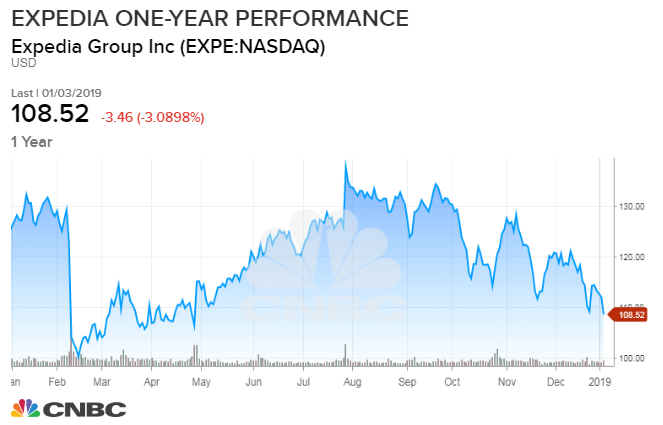 We believe we have seen evidence of this during recent periods where Expedia was able to drive bookings growth acceleration alongside leverage in ad spend," the bank's analyst Heath Terry wrote in note to clients Friday. As investors flee high-growth names in favor of value plays, Terry believes Expedia can move higher given its relatively cheap valuation. "We also believe the stock's relatively low trading multiple means it is likely to outperform in a tougher market environment for growth stocks," he wrote. The firm raised its 12-month price target on the stock to $140 from $125, which represents a 29 percent upside from Thursday's closing price of $108.52. Expedia also stands to benefit from an overall shift in consumer preferences, the firm believes. "While we expect the online travel environment to remain tight as supply growth stays muted, consumers globally continue to shift discretionary spend to experiences from goods...we believe the potential for Expedia to drive better returns on marketing...should drive outperformance in the stock." Expedia currently trades at 16.5X forward earnings, according to FactSet estimates. The stock is in a bear market, after falling 22.4 percent from its 52-week intraday high of $139.77 on July 27.